This New York Giants mock draft will only include the first-two rounds, but what a first two-rounds it will be! For the Giants to extract the most value out of their No. 2 overall pick in the 2018 NFL draft, they must look to trade back with a quarterback needy team. The Buffalo Bills will fit the bill for this extraordinary scenario. The Bills hold the 12th and 22nd overall pick, which will ultimately go to the Giants in addition to both their second rounders (53 and 56). This gives the Giants five picks in the first two rounds of the draft… If you don’t see the value in that, you may need to check your glasses prescription. We can debate on additional picks later, but for now, we are focusing on the first-two rounds. 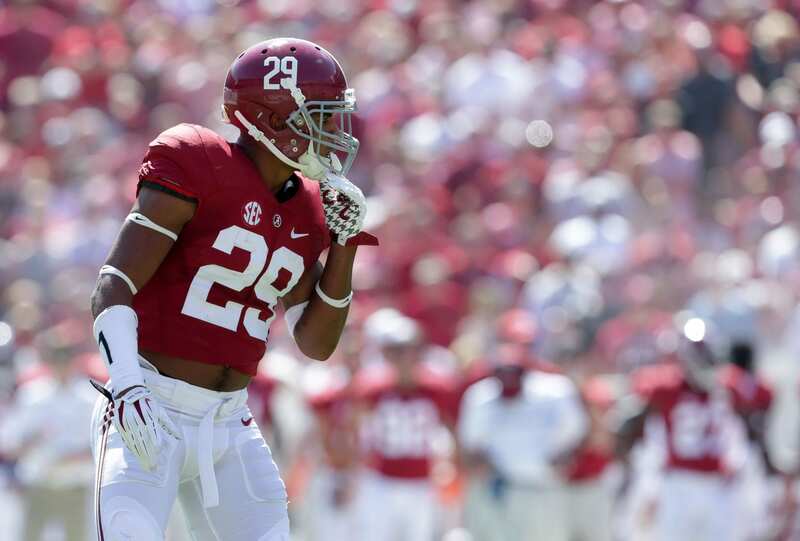 At 12th overall, the Giants will look no further than Alabama safety Minkah Fitzpatrick. The Bama product is a monster in coverage and could potentially translate into a Pro Bowl caliber cornerback at the next level. The guy can cover, blitz, and tackle violently. He’s arguably the most talented defensive player in the draft and would immediately solidify the Giants’ secondary for years to come. In conclusion, the Giants trade back and get the most NFL ready defender in the draft. With the 22nd overall pick, the Giants trade back with the Patriots to the No. 31 overall pick. They collect their second round pick (No. 43) and take OSU quarterback Mason Rudolph. WOW, that just took a turn. The Giants now have FOUR second round picks and a developmental first-round quality quarterback to compete with Davis Webb. Best case scenario, they both pan out and one of them is traded to a quarterback needy team. Remember, 2019 is a very bad year for quarterbacks. For more on Rudolph, check out this informative article! In the second round, the Giants address multiple positions of need. Right off the bat they grab Ohio States’ Billy Price and address the offensive line. A technical center with guard potential and Pro Bowl upside. At No. 43, the Giants take Auburn cornerback Carlton Davis. His outstanding size and length makes him an extreme value pick and provides youth at the cornerback position. The Giants’ secondary is now stacked full of talent and prepared to take on the future. With the No. 53 pick, GM Dave Gettleman takes Goergia running back Sony Michel. Michel is a tempered back with superb vision. He is capable of finding the holes and exposing them with speed and power. His frame is ideal for the NFL at 5-foot-11 and 220 pounds. He will immediately provide support for Wayne Gallman and begin developing into a workhorse back for 2019. With the Giants’ final pick in the second round (No. 56), they decide to look towards the defense line with USC edge rusher Rasheem Green. Green is a talent waiting to be unleashed, as he’s only a junior in college and 2017 was his first breakout season. At 6-foot-5, 275 pounds, Green is a menace, and with a bit of development he could be the perfect man to replace the departed Jason Pierre-Paul. He would fit perfectly in a 4-3 or 3-4 scheme, exactly what defensive coordinator James Bettcher is set to implement. I think the Giants should trade Odell Beckham and the # 2 to Cleveland for their #1 and # 4 picks. Cleveland gets a top 3 quarterback pick and star receiver. The Giants get a quarterback and Barkley.